Who doesn't like a bit of Disney? Lots of us have grown up with different Disney stories and characters as our inspirations and we often pass on this love of all things Disney to our younger generation. What many of us don't realise is that Walt Disney is about more than just Disney princesses and love stories, he actually had some powerful words and ideas too! 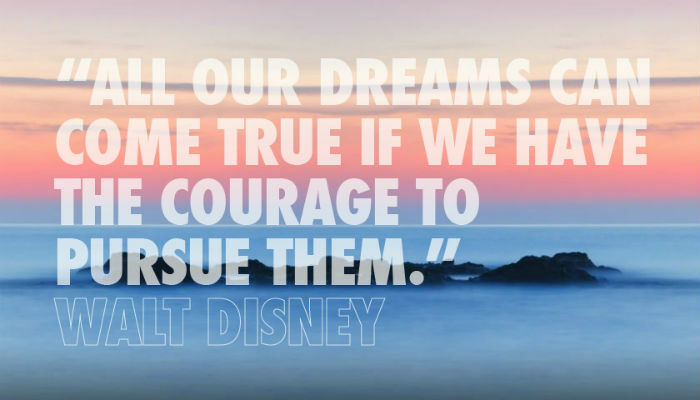 We love this quote because it is about chasing your dreams, which so many of us would love to be able to do more of in the workplace. Sometimes you just need a positive quote to boost your day and remind you exactly what you can achieve when you put your mind to it, which is exactly the idea behind these corporate ecards and the quote we chose. As the quote is so powerful in itself we didn't want to have too much color and busy scenes behind it, which is why we felt that this sea view was perfect - with just a splash of colour given from the sun on the horizon! Don't forget though we have lots of business ecards on offer so if this isn't quite what you need then keep looking. As the worlds largest Christmas ecards for business it is important that you remember that we can assist you with your seasonal ecards as well.